One of the most useful tools on any website is a Search function. When writing a SafetyAtWorkBlog article I regularly use the Search function (on the right of this page, or the bottom of your screen, depending on what device you are using) to remind me of what I have written previously. This avoids doubling up on topics or perspectives but also provides a thematic thread and consistency through the articles. For instance, try “quad bikes”, SWMS, Tooma or Quinlan. 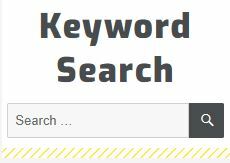 This Search function is a search of all the text in all of the thousands of articles in SafetyAtWorkBlog and is available to everyone, although Subscribers get the most value. I find the function is also useful for searching for names of people mentioned or quoted in the articles. This allows me to link people in new articles to their appearance in earlier articles. I love libraries for the amount of knowledge they contain, but the best libraries are those that also provide easy access to that knowledge. This is one of the beauties of the Internet and of Keyword Searches on websites. In the New Year, I am hoping to upgrade the Search functions on the website and would welcome readers’ and subscribers’ suggestions for improvement.